Nigel Morris Visual Artist – Visual experiences through print and paint. Visual experiences through print and paint. Nigel is a visual artist working in North Wales in the UK making paintings and prints, his work is mainly associated with the flatness of paper and canvas, but has a developing interest in the sculptural forms of these disciplines and explores the ideas of flatness, surface and formin relation to the printed/painted image. An emerging theme in the work is physical and perceived distortion, by usingthe simplicity and duplicity of line he investigates the balance and unity of symmetry, colour and spatial aesthetics promptinga manipulation of image using moiré distortion, interference pattern and spatial index. Although the complexity of these subjects could infer science and mathematical research Nigel’s interest remains in the visual perception of an artist eye. He is the print facilitator for The Regional Print Centre at Wrexham, North Wales teaching printmaking through courses and workshops. He recently completed an MA in Fine Art Studio Practice at the University of Central Lancashire, prior to this studied at The University of Chester and Edinburgh College of Art. He recently was awarded the ArtLab CPS prize for printmaking and was shortlisted for the Flourish Award. For some time now I have been making etchings using saline sulphate and the result have been improving all the time, ever since I started printmaking in 2009 i have never been content with any of the attempts at etching, I blundered through with the grounds and the etching needles and been dismayed as the images produced. Lately the context of my practice has re-assessed the geometric, drawn line aesthetic of my work in relation to my ideology of abstraction, the moiré effect is one outcome of this, another is the constructed geometric emerging by intuitive drawing using ruler and compass. These contextualise the grid, perspective and spacial awareness. By using the newer acrylic resists and aquatints available combined with the saline etch I have begun to make forward steps in my etching methods and prints. Now I look to Electro etching with guidance from the excellent Don Braisby, using steel but continuing with the acrylic resists and aquatint. 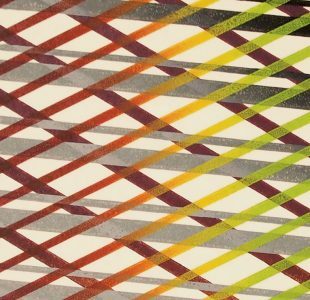 I have just completed a series of new linoprints, these engage the moiré effect that I am interested in at the moment, it is the crossover of lines and colours at different angles that creates a blur notion. Using the geometric circle as a vehicle for these lines enables a non-directional linear element to these prints. Unusually I have printed these as a very small edition as I normally print as a series of single prints connected through the plate using various combinations of plates and colours. I’ve been trying out some new things which are the akua Antonio and colour inks. Some interesting results comparing two the hawthorn inks which I normally use. They seem to dry quicker and don’t have the glossy finished looked at them.